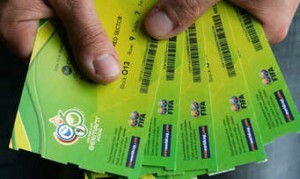 Fans will pay $90 for tickets to see 2014 World Cup matches in Brazil next year, $10 more than in 2010 in South Africa. FIFA announced ticket prices, including $15 seats which will be available to Brazilian students, people over 60 and members of social programs. In 2010, South African residents paid $20. Host nation residents will have access to at least 400,000 discounted tickets from the publicly available total of about 3 million. It is suggested that already applications for well over 2.5 million seats have been received. International fans will pay from $440 to $990, in three category bands, to see the final 13 July at the Maracana Stadium in Rio de Janeiro. FIFA said prices start at $220 for the opening match in Sao Paulo on 12 June. Top category seats will cost $495 each. At the other 47 group-stage matches, seats cost between $175 for Category 1 seats, to $90 in the cheapest Category 3 band. Prices for international fans are about 10% more than in South Africa in 2010. Despite the discounts, the prices are out of reach for most people in Brazil, where the average official minimum monthly salary is about $340. Let’s take a look at World Cup ticket prices in more detail. Here’s how the ticket prices for a preliminary match compares with the average cost of everyday essentials in Brazil…courtesy of Bloomberg Business Week. ► Category 1 seats, lower and upper levels most directly facing the field of play: 350 reais – equivalent to 5 months of residential electricity supply; or 21 months of residential water supply; or 27 months of coffee; or 23 months of meat. ► Category 2 seats, on the ‘shoulder’ of category 1: 270 reais – equivalent to 90 months of bananas; or 450 cell phone minutes; or 37 months of bread. ► Category 3 seats, at each end of the ground behind goal and adjacent to category 2: 180 reais – equivalent to 60 bus fares; or 10 months of butter; or 69 months of milk. ► Category 4 seats, top and back at each end: 60 reais – equivalent to 17 months of tomatoes; or 26 months of rice.